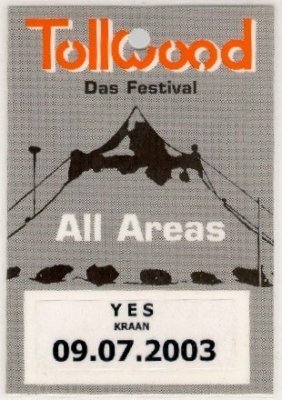 Although the show was in the Tollwood festival and the band had to shorten the setlist to 110 minutes, the audience seemed to enjoy a lot the concert at the Olympia park. The five musicians are in top form and the return of Rick Wakeman gave some additional feeling to the music, that maybe was lacked during the last tour with the orchestra. The lack of To Be Over was obviously disappointed, but otherwise the setlist was excellent indeed, kicking off with Siberian Khatru. Don't Kill The Whale sounds much better today than the version played on 1978/79, and it's much stronger. The highlights were obviously the duet We Are Heaven/South Side Of The Sky, with the strong presence of the bass of Chris to give the tempo. Roundabout was played in the shorter version, maybe because we were approaching 9.50 pm, the hour where the show had to be stopped. The same things happened during the other shows of the festival (i.e Saga, few days before) and, if it can be understood for bands that usually play some 2 hours set, it is not justificable in any case for a band like Yes, that play a 2,30+ hour set. I think the organizers of this festival should take good note that many people were disappointed by the short set and have shouted for a long time for an extra encore.